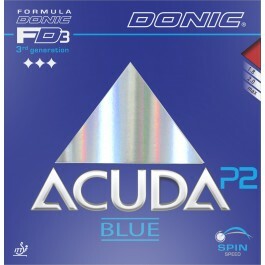 The new DONIC ACUDA BLUE rubber sheets captivate by its outstanding playing characteristics such as very good control and complete the features of the successful DONIC Acuda S rubber sheets by a high flight arc with topspin balls due to the grippy surface. Perfect backhand rubber for me. Combined with Yasaka Sweden Extra, I can really feel the ball and get maximum control. On serves that go to my backhand, I can almost allways open up straight away and put pressure on my opponent. I have waited a while for my rubbers, but it wasn't în vain. I am very happy to play with. I hope it îs not only an impression. This may be the best rubber I have ever played with. Combined with the Tibhar Power Wood blade, it gives me a huge advantage when counter driving. Was able to generate a lot of spin when looping. The catapult effect generated loads of speed & spin. I saw that the first time I played with it. I will continue with this rubber in the future. The Acuda Blue P-2 is way better than the Acuda P2. Very nice BH rubber, with Yasaka Rakza Soft on FH everything 2.0 on Xiom Zetro Quad, for me the best combination for quick attack and very good loop. Simply, I have feeling of the ball. I like these rubbers because I have more control now and I know where my ball is heading with accuracy. I recommend this if you want to learn your shots and effectiveness. Very fast, nice control and excellent attack. Nice blue design. Can go on fast blades or attack blades better, and makes your shots very powerful. Used it for 2 months so far and showing no sign of aging, with good cleaning after every session of course. This is my 3rd sheet of Acuda Blue P2. Does everything I need. Tremendous spin, good speed, solid feeling. Pairs very well on BH of Ebenholz NCT V. The only problem I have so far is that the top sheet is not the most durable. A few multi-ball training sessions will lead to pimples visible on rubber. I bought it on sale with doubt. After few uses on FH few times, I am in love with it. It feels soft, but generates a lot of spin. It is great for looping and blocking. Will keep it on FH. I have had good experience with this rubber. Will purchase from this seller again. Highly recommended seller. First I used it on RPB for control and spin. I figured the 3's in the donic series was too soft for my liking, and p1 a bit too hard. Therefore P2, is perfectly balanced and have predictable gears imho. Now I'm currently experimenting with shakehand, and it's still to my liking. Nice and soft feeling. Working good on both sides. Especially for those who prefer such soft feeling.Not as fast as EL-P for example but provide better feel and control, especially on FH. Very good rubber for attacking topsin. This rubber is absolute magic. Great active and passive blocks, close and middle distance topspin and looping is absolutely fantastic. Godly spin on FH loops. Great choice for a good price. Great rubber. I can apply more control and have the speed to attack. Strongly recommend this product for BH. Am using 1.8mm on bh, its a little slow, probably should be using 2.0mm. Excellent spin and Control. I like it. I can apply more spin comfortably and still have the speed to attack. I strongly recommend that product. This rubber has decent speed, good spin and control. Works well for bh, I prefer something faster for fh, like evolution mxp. the speed is not that impressive. but the control is superb. very good to players who like soft ruubers. spin is great! That 's very good rubber, excellent for control and spin. the speed also fast enough. You can combine it with an off or off+ blade and the result will amaze you !! Great loops , spins , smashes but from the other way you can easily block your opponent's hits and have a great control as well . I use it with a TSP infinity carbon blade and also with a STIGA Emerald vps V in max thickness both sides. The spin is monstrous, definitely the same as the tenergies, but the control is much better, good sound and a lot of gears. Looping is awesome close or away from table. Very good FH rubber! As a Donic product it has perfect quality , well balanced rubber with average speed and spin but when you improve your tecnique it reacts quite well and becomes more speedy and spinny !! It depends from the quality of hits you are doing !! This is a moderately fast rubber, with very good spin and control. Placements and blocks (forehand and backhand) are executed confidently. It has an extra gear if you put in the effort to get more speed, spin and loop. Would definitely reload on this rubber if they go on sale again. Great active and passive blocks, close and middle distance topspin and looping is absolutely fantastic. One of the best back hand rubbers in the market right now . Perfect backhand rubber. Beautiful blue sponge, and easy-to-create-spin rubber. I would not recommend you as a forehand rubber, as I recommend hurricane 8 as your forehand rubber. Currently running this on the forehand side with max sponge and it's the best bargain I've found for heavy spin play. The Tenergy is over-rated and over-priced in comparison. The speed seems a hair slower than the DHS National, but that's fine as I tend to spike in volleyball fashion more than a proper smash as it is. I looked for a lighter rubber than jp-03, that could fit my rpb bh meanwhile not being AS soft and with great spin. Well, I found it. Have not played with it for so long, but so far I'm a 100% content. Medium fast and very spinny rubber. Very happy with it. The rubber is ideal for attacking players. It is a bit softer than Acuda P1. Its spin ability is too much and it gives a good control ability.